Well, despite taking November 13 and 14 off of work, and working all day on November 16 to try to bring Halo up to speed, I was unable to get it running in time for my first Friday match and had to throw in the towel. Apologies to all. As usual, the competition was a blast. I've got a few months to get Halo into the pink for the next event. I rewrote the code for my speed controller. The Rott-bot speed controllers used a single 16C63, measuring pulse widths with the the two CCP modules and generating wheel PWM in software. 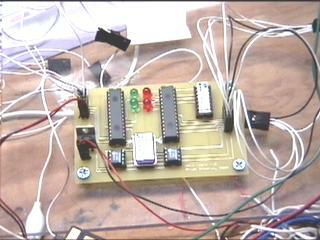 My PWM rate was about 60 Hz with Rott-bot 2000, which is a very slow rate, and gives bad low-end torque. The Halo speed controller has two 16C63s, the first of which measures radio pulses, calculates wheel speeds, and sends that data via SPI to the second 16C63, which generates PWM in hardware. My PWM rate went up to about 3.9KHz. Since the Rott-bot blinkenlights were invisible both to cameras and audience, the Halo logic board doesn't have them. I only have two lights on the RC PIC (to show when the stick is centered) and two on the PWM PIC (to show error conditions in the SPI data). The logic board also has two 12C508s for doing pulse measurement and switching, as on the Rott-bot board. This is implemented as a simple state machine. In the picture, the silver tin can at mid-bottom is the 4MHz crystal that lets the whole thing run, and the white DIP in the upper right is just a bank of resistors for current limiting on the LEDs. The TO-220 is the voltage regulator. The jack at the upper left is for attaching leads to the Rx. The jack at the right is for attaching to the power boards. Ouch. This is where the real problem was. 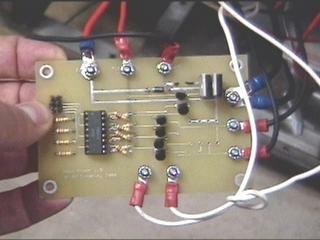 The traces I had for the high-current FETs were too small, and one of them was blown out as soon as I applied power. That was a forehead-slapping "duh!" moment, but the real puzzler was that the relatively simple on/off transistor switches that only had to handle ~100mA of relay coil current also didn't work. You can see the burned trace in the upper right, just behind the pair of paralleled FETs. You can also see evidence of a mistake in my layout -- I had the pull-up and pull-down resistors were reversed after the optoisolator, so I "fixed" this by cross-wiring the resistors. Those four little Xs of resistors were supposed to be eight resistors neatly in a column. I'll be working on redesigning these over the next few weeks. I hope to have Halo running before Christmas, and with any luck there will be another event in the spring. Jay Leno interviewed me, although he didn't use that interview on the November 22 Tonight Show. I missed him, but Penn Gillette of Penn & Teller was wandering around the pit area on Sunday morning and, I'm told, fondled Halo. And I got some positive comments from some builders whose opinions I have a lot of respect for. Despite not being able to compete this year, I had a wonderful time. I'd like to thank Trey and Greg for putting on a really smooth show, and Paul Mathus (Das Bot) and John MacKenzie (Ankle Biter) for their help and encouragement in the pits as I struggled to breathe life into Halo.